Let’s just admit it – we all hope that family heirlooms exist and someday we will be recognized as the family archivist to whom all the heirloom objects and photos should be sent. I’ve never really encountered an heirloom in my family and there are a lot of possible reasons for that sad state of affairs. But recently my wife Ellen handed me one of her family’s unidentified heirlooms in the hope that I might be able to identify the original family member to whom it was connected. Ellen had acquired an old walking cane (pictured above) said to have been the possession of an unidentified ancestor. The cane has an ivory handle which is joined to the wood shaft by a gold engraved band. As can be partially seen in the photo below, the engraving was the key to identifying the original ancestral owner. According to the engraving, the cane was presented to “J.J.H.” in 1876. Fortunately, my wife only has one ancestor who has the initials J.J.H. and he was alive in 1876 making my job a lot easier (sometimes it’s good to get lucky!). J. J. H. is Ellen’s third great grandfather, Jacob John Hailer (pictured below). Jacob is, along with a few other of Ellen’s relations, a member of the Waterloo Region Hall of Fame. The Waterloo (Ontario, Canada) Region Hall of Fame describes Jacob’s contribution to the area as “Jacob Hailer, a pioneer furniture manufacturer, was deeply religious and was very active in establishing the Evangelical Church in Canada. It is recorded that Sunday School was held in his Spinning Wheel Shop at the corner of what is Scott and King Streets in Kitchener and that members of Canada’s First Nations often dropped in to observe what was going on. 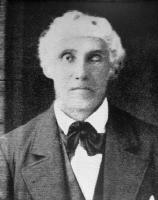 Jacob was born on 20 December 1804 and passed away 6 March 1882. Perhaps he received the cane as a birthday and/or Christmas gift in 1876. We don’t know the circumstances of the presentation and perhaps we never will. I'm slightly amused because you have a cane and no story. I have a great story of a silver cane given to an ancestor, yet no one knows who has the cane now. Hopefully, you get all the details for this treasure.